Demand for coal is on the decline in the U.S., phasing it out in favor of natural gas and renewable energy sources such as solar and wind power. This has led many investors to conclude that coal stocks will soon become irrelevant and eventually go out of business. However, this is far from true. The best coal stocks still produce hefty profits, and in some cases pay strong dividends. In this article, we will discuss the attractive investment characteristics of coal stock Alliance Resource Partners (ARLP). Alliance Resource Partners is a master limited partnership (MLP) that became public in 1999. It was the first coal-related MLP to become public and has now become the second largest coal producer in the eastern U.S., with 8 underground mining complexes in Illinois and Appalachia and a coal loading terminal in Indiana. Since 2014, the company has tried to somewhat diversify and thus it now receives royalty income from some oil and gas producing regions. However, as the company generates just 5% of its total EBITDA from this royalty income, it should be viewed as an essentially pure coal producer. Most developed countries have been trying to reduce coal consumption. U.S. is not an exception; its consumption of coal peaked in 2008 and has decreased since then. However, China and India continue increasing their coal consumption at a fast pace. The strong demand from these countries led the U.S. coal exports to reach 116 million short tons in 2018, the highest level in five years and almost twice the level of 2016. The strong demand from Asian countries has provided a significant boost to the price of coal in the last three years. The price of steam coal, which is used as an energy fuel, has risen from the low $50s in 2016 to $59 per ton. Even better, the price of metallurgical coal, which is used in the production of steel, has surged from the low $80s in 2016 to $138 per ton. Alliance Resource Partners has greatly benefited from the strong demand overseas. Its coal exports have increased from 4.5% of its total output in 2016 to 22.1% in 2018. Last year, the company posted record sales volumes and grew its revenues and its earnings by 11.5% and 21%, respectively. 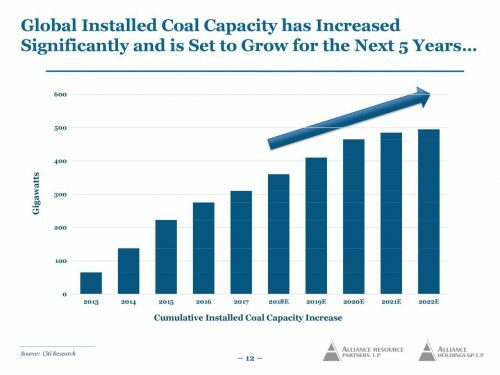 Despite the efforts of most developed countries to phase out coal, global installed coal capacity has remarkably increased in the last five years and is likely to continue growing at a significant pace for years. Alliance Resource Partners is ideally positioned to benefit from this trend, as it is a major exporter of coal. Its management has provided markedly strong guidance for this year, expecting the earnings to grow from $366.6 M in 2018 to $505.5-$545.5 M this year. At the mid-point, this guidance implies 43% earnings growth. Of course investors should not extrapolate this growth rate in the future but they should expect meaningful growth thanks to the sustained demand growth from Asian countries. Alliance Resource Partners has a significant competitive advantage. Its mines have a much lower production cost than the majority of U.S. mines. As the coal industry is highly cyclical, this competitive advantage is of paramount importance, as it helps the company remain profitable during downturns whereas many of its peers incur hefty losses in such periods. The low cost base of Alliance Resource Partners makes it easier for the company to withstand the fierce downturns of its industry. On the other hand, investors should not conclude that Alliance Resource Partners is immune to recessions. As the coal industry is extremely cyclical, with dramatic swings in the coal price, all the coal producers are vulnerable to downturns. In the most recent downturn, which was triggered by the collapse of commodity prices during 2014-2016, Alliance Resource Partners saw its earnings per share plunge 56% and its stock price slump 80%. It is thus evident that risk-averse investors and income-oriented investors should avoid coal stocks in principle. As mentioned above, in the downturn of commodities, the results of Alliance Resource Partners came under great pressure. Consequently, the MLP was forced to slash its distribution by 35% in 2016, from $0.675 to $0.4375 per quarter. However, the company has managed to raise its distribution in most quarters since then. As a result, Alliance Resource Partners has regained almost half of the lost ground with respect to its distribution, raising it to $0.53 per unit in the most recent quarter. This corresponds to an exceptional 11.0% distribution yield. 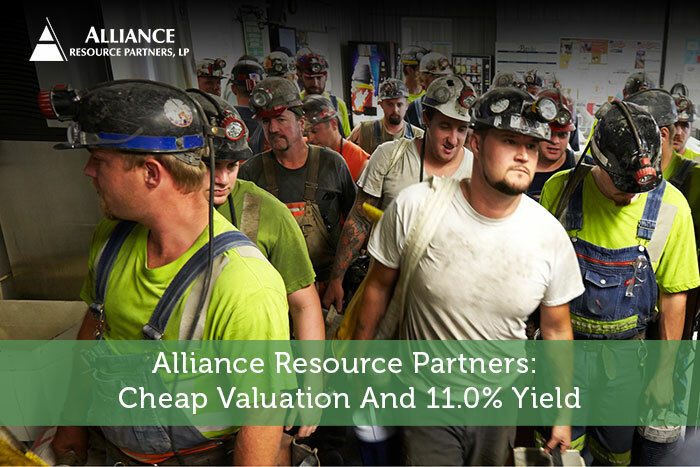 While such extraordinary yields usually signal that a distribution cut is just around the corner, this is not the case for Alliance Resource Partners. Its current payout ratio is 77%, which means that its earnings are sufficient to fund its distribution. The payout ratio is much better (58%) if the distributable cash flow is used instead of the earnings. Moreover, as the company is poised to grow its earnings at a fast clip this year, its payout ratio will significantly improve. Furthermore, the MLP has one of the strongest balance sheets in the MLP universe, as its net debt of $788 M is less than twice its annual earnings. Given the healthy payout ratio, the promising growth prospects and the strong balance sheet, the distribution can be considered safe for the foreseeable future. On the other hand, while a downturn in the coal business is not on the horizon right now, investors should not ignore the high cyclicality of the industry and the extreme sensitivity of all the coal producers to the price of coal. Overall, while the extraordinary distribution yield is safe for the foreseeable future, it may come under pressure whenever the next downturn shows up. Nevertheless, even if Alliance Resource Partners is forced to cut its distribution in such an event, it will still be offering an attractive yield. For instance, if it cuts its distribution by 35%, as it did in the last downturn, it will be offering a 7.15% yield. Alliance Resource Partners is trading at only 5.9 times its distributable cash flow and 6.9 times its earnings. Given this cheap valuation, the 11.0% distribution yield, the healthy payout ratio and the strong balance sheet, the stock is likely to highly reward investors in the absence of a downturn. Nevertheless, investors should always keep in mind the high sensitivity of the stock to the fluctuation of the coal price and its vulnerability to downturns. Therefore, if they purchase the stock based on its above attractive characteristics and the bright outlook of the coal industry, they should limit the portion of their portfolio that they allocate on this stock.